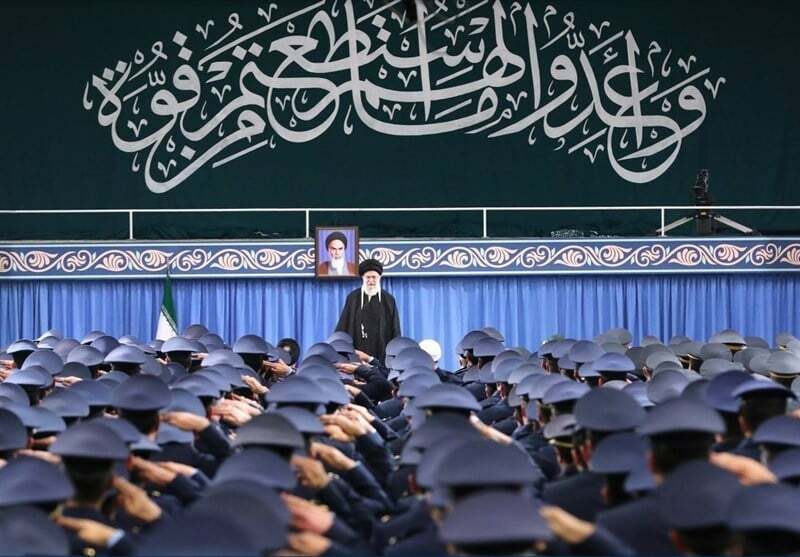 Leader of Iran’s Islamic Revolution Ayatollah Seyyed Ali Khamenei says the Iranian nation’s “Death to America” slogan does not address the US nation, but their president and statesmen. “The US is an embodiment of evil, but yet complains why you [Iranians] chant ‘Death to America’,” the Leader said in a Friday meeting with a group of Iranian Air Force commanders and personnel in Tehran. “First of all, I should tell the American officials: Death to America means death to Trump, John Bolton, and Pompeo. It means death to American statesmen, which currently include these people,” he noted. He also noted that the US regime’s existence has always hinged on encroachment upon others with the aim of securing their own interests. In his Friday comments, the Leader also dismissed the human rights criticisms leveled by European countries against the Islamic Republic, saying that they themselves are cracking down on their citizens and are thus in no position to criticize Iran. “In the streets of Paris, they attack protesters and blind them, and then shamelessly make human rights demands on us,” Ayatollah Khamenei said. “Do you even know what human rights are? They never knew what human rights are either today or in the past, and even throughout their history,” the Leader said. I think most people in the world out here wish the USA would change its ways.